Most dried beans are high in nonheme iron. 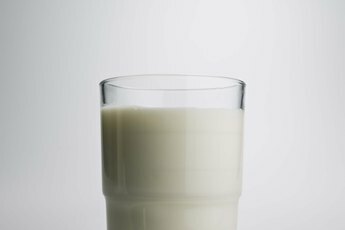 Iron is an essential component of several important enzymes and proteins in the body including hemoglobin, the protein in red blood cells that delivers oxygen to cells. Dietary iron comes in two forms -- heme and nonheme. Meat, poultry, fish and seafood contain mostly heme iron, while vegetables and other plant-based foods provide only nonheme iron. Although heme iron is more readily absorbed, you can enhance your absorption of nonheme iron by consuming it with vitamin C or heme iron. Like many legumes, lentils are an excellent source of iron. With 6.59 milligrams of iron per cup, cooked lentils provide approximately 37 percent of the daily value of iron. Lentils are also high in protein, fiber, folate, vitamin B-6 and potassium. Top curried lentils with sliced cherry tomatoes for a light, iron-rich meal. 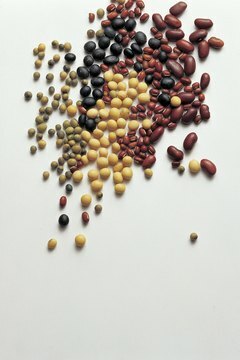 Most dried beans, including kidney, lima, navy, pinto, garbanzo, adzuki, cranberry and black beans, are high in iron. A cup of cooked red kidney beans provides 29 percent of the daily value for iron, while cooked adzuki beans and navy beans supply about 26 percent and 24 percent of the nutrient’s daily value per cup, respectively. Add meat or chopped tomatoes to three-bean chili to increase the amount of iron you absorb from the beans. Both immature and mature soybeans are excellent sources of iron. Immature, or fresh, soybeans are green and are typically eaten in the pod. One cup of cooked, fresh soybeans contains 25 percent of the daily value for iron. 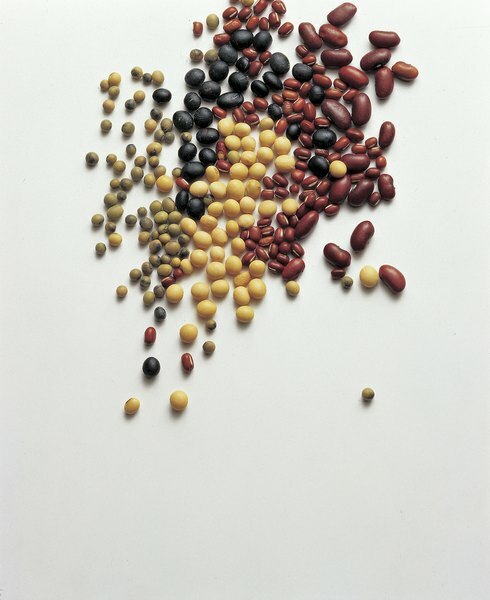 Mature, or dried, soybeans supply 49 percent of the daily value for iron per cup of cooked beans. Make a refreshing summer salad of soybeans, thinly sliced red onion, chopped parsley, lemon juice and olive oil. With the pod or without, fresh green peas are a good source of iron. Cooked green peas provide 14 percent of the daily value for iron per cup, while the same amount of cooked, podded peas contains nearly 18 percent of the nutrient’s daily value. Raw, edible pod peas are slightly lower in iron per cup but are higher in iron-boosting vitamin C. Eat them plain or with fresh hummus. Dark leafy greens such as spinach, kale, collards and chard are also high in iron. Raw, dark leafy greens are generally a good source of the nutrient, but cooked greens are more concentrated and, consequently, higher in iron. A 2-cup serving of raw spinach provides 9 percent of the daily value for iron, while a 1-cup serving of cooked spinach supplies 36 percent of the daily value. Most dark leafy greens also contain significant amounts of oxalic acid, a compound that inhibits nonheme iron absorption. 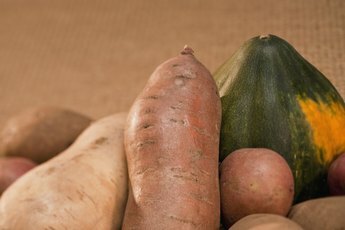 Consuming these vegetables with heme iron or vitamin C helps overcome the effect of this compound. The Jerusalem artichoke, or sunchoke, is a tuber vegetable that resembles ginger. Apart from the most iron-rich legumes, it ranks as one of the best vegetable sources of iron. One cup of raw, sliced Jerusalem artichokes provides more than 5 milligrams of iron, or 28 percent of the nutrient’s daily value. 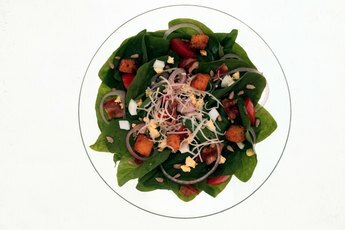 For an iron-rich, satiating salad, toss raw, grated Jerusalem artichokes with tender greens, mandarin orange slices, chopped, poached chicken and toasted walnuts. Is Okra Good for You? 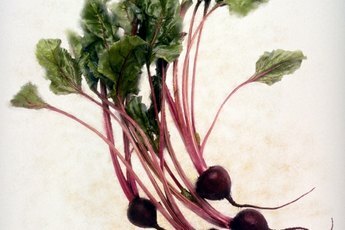 Are Beets High in Beta-Carotene?